Update - I wear this top quite a bit and have had a few compliments. Glad I made it. Will get a shot of me in it sometime and post. 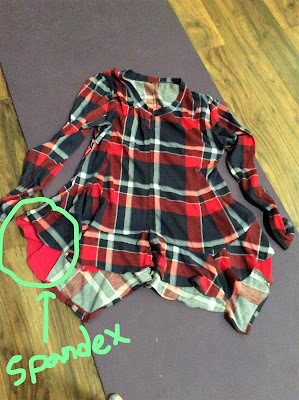 I ran out of the plaid fabric, so I used some red spandex on the underside of two of the flares. It's a nice top. It zips up. I'm trying to eat more healthy filling food - too many chocolates and ridiculous amounts of sugar in our house right now. It's a conspiracy to make me fat! Here's what I made: cheeseburger muffins. Also, and unrelated, I used bitly for the first time today. First scoop blobs of dough into tins. Then try to somehow spread them out and up the sides. Finally, scoop in cooked meat, bake, then add sauces, cheese, rebake for 5 minutes. Tada!